Modern industrial research uses sophisticated measuring technology to validate and test its working models in a laboratory environment. It can be a real challenge to compile measurement data from a wide range of sources (cameras and other sensors) into meaningful information. Noterik’s Stageplayer does just that. It is an advanced media player that allows researchers to navigate through measurement data and watch all recorded media play out completely in sync with the data, providing researchers with invaluable information at their fingertips. The Stageplayer was developed for and in collaboration with MARIN, world’s leading institute in hydrodynamic and nautical research and development. MARIN does on regular basis tests that measure the performance of vessels under different conditions in a simulated environment. 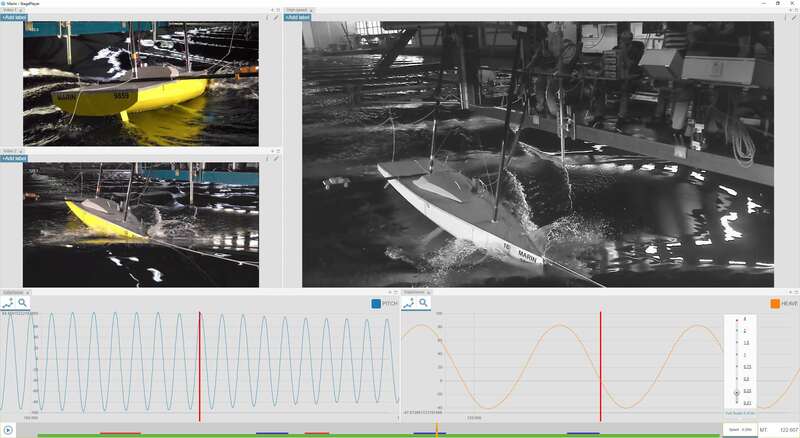 The Stageplayer provides them with a singular stage to watch the graphs of measurement data in a completely synchronised fashion with the recorded images from different types of cameras (high-speed, under-water, mini, remote-controlled). The videoclip below gives a brief demonstration of the tool (with audio commentary in Dutch). The Stageplayer features a timeline, a dataviewer and a playout stage in a flexible, resizable panel. The timeline displays the various media assets, all synchronised with one another. The dataviewer translates selected data channels into graphs, that can be zoomed in and out. Selected video channels can be put on stage, so they can be watched simultaneously or alternately. You can adjust playout speed, for example to slow down playout of a high-speed video (2400 frames/second) so you can view it alongside a recording at regular speed. Exact numeric data can be displayed where ever you want. All in all, an extremely versatile tool that provides useful information in an intuitive, interactive and instant interface. The Stageplayer is the front-end player of InSync, a media asset management system that facilitates the complete media workflow of industrial research activities.